Make sure your iPhone mute switch is NOT set to mute or sounds will not play. Audio Test is the simplest way to test your iPhone capable home or car audio system. All tones and illusions accessed on a single page! 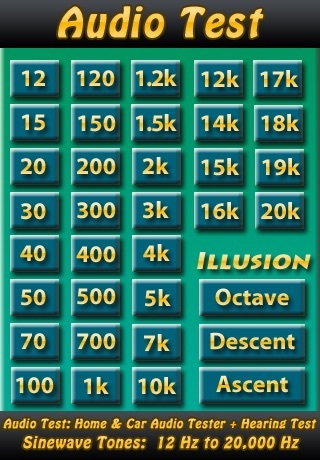 Note that for higher tones, finer steps are used to allow you to determine an accurate high frequency hearing limit. Under ideal laboratory conditions, humans have a hearing range of 12Hz to 22,000 Hz. The iPhone built in speakers are limited to a low frequency limit is around 100 Hz to 120 Hz which can only be heard in a quiet setting and with ear close to the phone. A home or car audio system should be able to reproduce the lower tones depending on the system capabilities. Multiple tones can be played by tapping two buttons in rapid succession. In this way you can demonstrate correct operation of even the lowest tones as they will produce an audible beat note when paired with a second tone. The typical high frequency hearing capability vs. age is as follows. Elephants have low frequency calls in the 15 Hz to 35 Hz range. Call your local elephant! Do not high frequency tones at high volume or into headphones or earphones. The tones may seem inaudible or lower in volume than they actually are. Hi-volume tones can cause hearing damage. Use caution on high frequency tones at 10 kHz and above if external amplification is used or if headphones or earphones are used. Audio Illusions present various audio sequences that seem to rise or fall but end up going "no where" and end up back where they started.